6 x 50m strides after. goal is anything under 1:25. Want to get out about 6:20-6:25 and work down from there. First race back in about a year and a half. Was shooting for around 1:24, but i had not given myself ample training time to build any speed, so I feel apart after mile 5 (which i hit in 32:00, which was right on where i was looking at 6:24 per mile). Mile markers were off, which was strange because this is a huge half-marathon (6000 runners) and another 2000 in the full marathon. That was frustrating, because althought I was slowing down, the markers were oddly placed enough to make me wonder where I really was on the course (such as the 10 mile marker). Overall, finished in 1:27:47, not terribly dissatisfied with that time because it was my debut back into competitive running after the longest hiatus in my life. 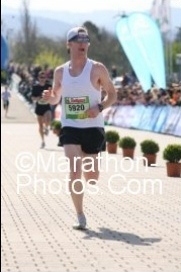 Lost a lot of fitness (as my last training cycle before this netted a 1:18 PR half). I will get back to that, it just takes time. Probably could have started back into a shorter distance, but it was nice to know i can go run a half off a decent training cycle. 85th overall place out of 6000. tried gluten-free the night before and morning of....no stomach problems...minus a side cramp.